Baro serves nuevo latino cuisine created by it\'s amazing columbian/canadian Chef Steve Gonzalez... so we put together a mix just for him, using cue\'s from his personal list of favorite songs - music that motivates him to cook, music that represents his culinary vision. 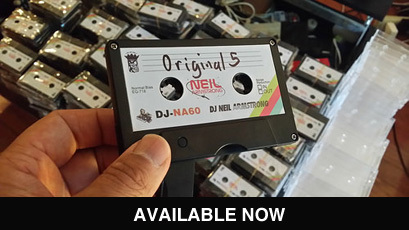 DJ Neil Armstrong DL Dinner & A Mixtape feat. Chef Steve Gonzalez This was the mix released exclusively for </b><a href="http://www.facebook.com/dinnerandamixtape">Dinner & A Mixtape II</a></b> with <b>Remy Enjoy Music</b>, Featuring sounds inspired by <b><a href="https://www.instagram.com/latino5spice/">Chef Steve Gonzalez</a></b> of <b><a href="https://www.instagram.com/barotoronto/">Baro Toronto</a></b>. <p> Here it is for y'all who couldn't join us for the night. About an hours worth of music - some Hip Hop, Salsa, Brazilian, Freestyle... put together with that signature DJ Neil Armstrong story telling aesthetic . This mix, as well as Scratch Bastid's mix & Steve Gonzalez’s recipes for the menu, were presented to all dinner guests on a Cassette USB. These limited edition items were only available if you came thru (that's right, snooze ya lose) - BUT , because we love ya, here is the mix for you to download to your library of mp3's. This mix is essentially a soundtrack to Steve Gonzalez life as a Colombian/Canadian chef. After doing some interviews with him, we compiled a list of his favorite tracks - music that motivates him to cook, music that represents his culinary vision, music that represents Chef Steve. Ultimately, the idea was to listen to this mix at home, while you recreated the dishes using his recipes, so you could revisit the atmosphere and feeling you got when you joined us for <b>Dinner & A Mixtape.</b> <p> Make sure to listen to <b>Scratch Bastid's</b> side here - <a href="https://www.mixcloud.com/skratchbastid/skratch-bastid-dinner-a-mixtape-41218/ ">https://www.mixcloud.com/skratchbastid/skratch-bastid-dinner-a-mixtape-41218/ </a> <p> Hope you enjoy this, feel free to share with your friends and let em know about <b>your friendly neighborhood Mixtape DJ - DJ Neil Armstrong</b>. This was the mix released exclusively for Dinner & A Mixtape II with Remy Enjoy Music, Featuring sounds inspired by Chef Steve Gonzalez of Baro Toronto. Here it is for y'all who couldn't join us for the night. About an hours worth of music - some Hip Hop, Salsa, Brazilian, Freestyle... put together with that signature DJ Neil Armstrong story telling aesthetic . This mix, as well as Scratch Bastid's mix & Steve Gonzalez’s recipes for the menu, were presented to all dinner guests on a Cassette USB. These limited edition items were only available if you came thru (that's right, snooze ya lose) - BUT , because we love ya, here is the mix for you to download to your library of mp3's. This mix is essentially a soundtrack to Steve Gonzalez life as a Colombian/Canadian chef. After doing some interviews with him, we compiled a list of his favorite tracks - music that motivates him to cook, music that represents his culinary vision, music that represents Chef Steve. Ultimately, the idea was to listen to this mix at home, while you recreated the dishes using his recipes, so you could revisit the atmosphere and feeling you got when you joined us for Dinner & A Mixtape. For the Last Dinner & A Mixtape with Remy Enjoy Music, we headed up to the great north & teamed up with Skratch Bastid & Chef Steve Gonzalez of Baro Toronto. Usually when I do a Dinner and a Mixtape event, it's to release an existing project that I've been working on. For the Remy Series, we're switching up the format a bit, and creating mixtapes specifically for the chef & venue. Baro serves nuevo latino cuisine created by it's amazing columbian/canadian Chef Steve Gonzalez... so we put together a mix just for him, using cue's from his personal list of favorite songs - music that motivates him to cook, music that represents his culinary vision. Don't Call me no F****n Dishwasher... I'm El Jefe. 21) Cha Cha - D.R.A.M. I have been a fan for over 15 yrs. I lost my collection of your music in a fire last year. I follow you on mixcloud, but certain mixes can’t be play like DNA of the Blueprint. Please let me know when load up so I can purchase all of your mixes.